The BBC/PBS Mystery Masterpiece Adaptation of PD James' Death Comes To Pemberley hits PBS tomorrow night (check your local listings) and finishes up Sunday, November 2nd. 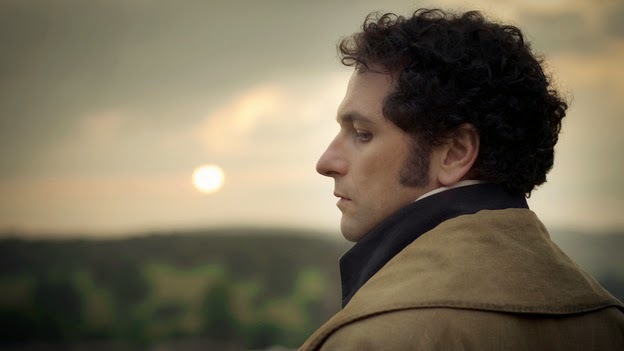 The show stars Matthew Rhys of THE AMERICANS who leaves behind his Russian spy turned America persona to Fitzwilliam Darcy (there's a great interview with him about playing Darcy here). Elizabeth Bennett is played by Anna Maxwell Martin. The action begins six years after the Jane Austen books end and Darcy's relationship with Elizabeth is a bit strained at the weight of trying to maintain Pemberley. Here's a clip from the BBC showing. My DVR is set. Will you watch Death Comes to Pemberley? I can't wait to see this. Matthew Goode is in it too, he's adorable!